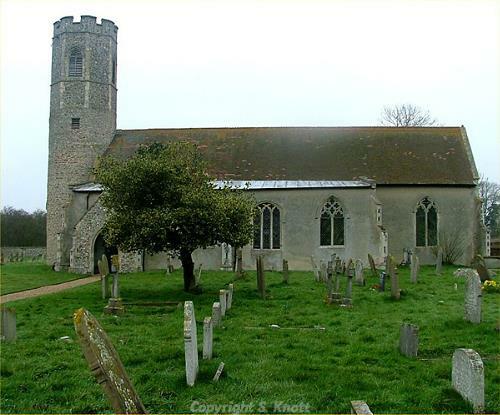 This church has a 12th century round tower and stands within a pleasantly walled churchyard. The nave and chancel are combined as one and are of medieval date, although the present exterior owes much to the restorations of 1878-79. The Perpendicular aisle roof was restored in 1966 and is notable for its fine carved spandrels. The bells of the church date to 1641 and 1722 but are hung from a 15th century frame. Both the frame and the bells have been earmarked for repair. Other fittings include a Jacobean pulpit and a simple 13th century carved stone font. Has 15th century frame in very poor condition . To be preserved, bells rehung. Bells of 1641 by J. Brend (5) and 1772 (1). In 1812 the main road was moved from north of the church to south of the church, in order to enlarge the park of the Hall; before this date the north door rather than the south was the main entrance. E. Rose (NLA) 6 February 1997. See (S1), which includes (S2). T. E. Miller (NLA) 19 April 2006. The bell of 1772 is by Pack and Chapman and is cracked. It is to be recast. E. Rose (NLA) 1 September 2003. --- Aerial Photograph: TM2894 A-C,D,E,K,M,P. --- Aerial Photograph: Edwards, D.A. (NLA). 1996. TM 2894T-W, Y-AC. --- Monograph: Hart, S.. 2010. Medieval Church Window Tracery in England. pp 97, 120. --- Leaflet: Roy Tricker. 1977. The Hempnall Group, A Historical Guide..
<S3> Newspaper Article: 24 June 1982. Eastern Daily Press.